THE expression “in the groove” suggests a top jazz performance or to be delighted with. Both apply to Way Out West’s second offering. As with Footscray Station, Asian and African influences are unmistakeable, but it’s as if old grooves — tunes and rhythms with a sense of history — are mapping new territory. And it works. 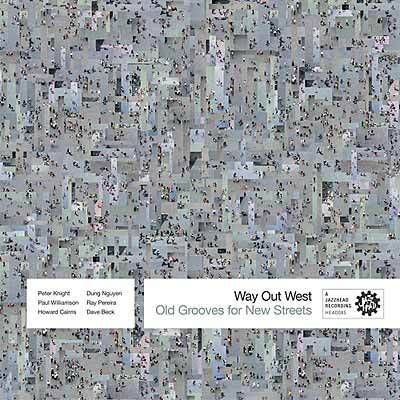 In compositions by trumpeter Peter Knight and, on three tracks, all these talented musicians, Way Out West creates a changing, layered streetscape that moves and grows, cemented often by rhythm. It’s not a melting pot, but an engrossing soundscape. Dung Nguyen (modified electric guitar, dan bau, dan tranh) and Ray Pereira (percussion) bring sounds from Vietnam and Africa and saxophonist Paul Williamson adds a beautiful solo with Middle Eastern influence. The result, with Howard Cairns (acoustic bass) and Dave Beck (drum kit and percussion), breaks new ground. In short: Heads in directions that are streets ahead of your Melway. This entry was posted in CD REVIEWS and tagged dan bau, dan tranh, Dave Beck, Dung Nguyen, Howard Cairns, paul williamson, Peter Knight, Ray Pereira, Way Out West. Bookmark the permalink.